If you or a loved one is dealing with an alcohol addiction, you’re most likely thinking about treatment. However, if you use alcohol frequently for a significant period of time, withdrawal ranges from uncomfortable to deadly. Fortunately, undergoing the proper alcohol withdrawal treatment can keep you comfortable as you eliminate the chemical from your body. Choosing to stop using alcohol is courageous. Because the experience can be daunting and overwhelming, those who struggle with alcohol abuse never seek help. The right way to start addiction treatment is to detoxify your body. Alcohol is poisonous. Therefore, it slows down the way every organ functions. You must rid yourself of the substance so that it stops affecting your overall health. Additionally, alcohol is a depressant. Thus, it delays communication within the nervous system. When you stop using it, your body becomes overstimulated. For example, your neurons fire more rapidly and your physical mechanisms begin to regain function. If you’ve been using alcohol for a long time, your body might not be able to handle this activity. Consequently, quitting cold turkey without medical supervision could lead to seizures, a dramatic increase in blood pressure, and a dangerous elevation in heart rate. People who consume large amounts of alcohol every day may have more serious detox symptoms. For example, seizures are the most serious alcohol withdrawal side effect. The risk of seizures often persists for several days after detox begins. Additionally, delirium tremens is a hazardous condition that affects people with extreme alcohol addiction. It’s a combination of seizures, fatigue, and central nervous system changes that can be fatal. Delirium tremens can come on several hours after the last drink or up to 10 days after starting detox. You should seek medical alcohol withdrawal treatment if you or a loved one is at an increased risk of developing this condition. 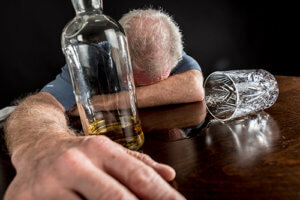 There are various methods for treating alcohol addiction. For a severe addiction, most medical professionals recommend inpatient treatment. A person with extreme withdrawal symptoms might need to stay in a detox facility for approximately five to ten days. Outpatient rehab or a partial hospitalization program allows patients to live at home while going through alcohol withdrawal. Medical treatment may be offered during the day, but the patient sleeps in their own bed. This is typically more effective for people with mild withdrawal symptoms. In some cases, alcohol withdrawal must be medically managed. Doctors administer alcohol detox medications during inpatient or outpatient detox programs. Those at a higher risk for developing severe side effects may require around-the-clock care. Treatment doesn’t end with detox. The right blend of psychotherapy, holistic approaches that address the entire body, and medical care is crucial to successful recovery. At 1st Step Behavioral Health, we extensively evaluate each client to create a custom care plan. We begin therapeutic treatments during the detox stage to help set a foundation for further healing. Additionally, our facility provides long-term support to ensure the effectiveness of our strategies. As you move through your alcohol treatment program, you’ll gain insight into your past, present, and future. We’ll be with you every step of the way. Managing the alcohol withdrawal process properly is essential for a sober future. In addition, ongoing support is fundamental to a healthy life. Call 1st Step Behavioral Health at 866-319-6126 to find out how we’ll help you reach long-term sobriety.